Eric and Tina were getting engaged and looking for design inspiration when they saw a picture of a vintage ring with aquamarine accents. (Aquamarine is a a precious stone with blue and green color hues.) It was an interesting concept that they loved. 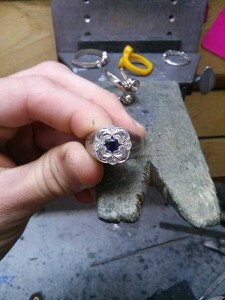 Eric wanted to create an engagement ring with that same feel, but with diamonds. Karen worked with Eric on the designs for both rings. Eric was going for a specific feel and only had a rough idea of what he wanted the finished items to look like. Karen brought the elements of the initial design idea and Eric’s vision together in a computer design. After a couple of modifications, Eric was thrilled with the final design. A model of the ring was created for final approval and then cast in platinum. Eric wanted a truly vintage version of the diamond and chose to have it “rose cut”. This means it doesn’t have a flat top. It’s a dome shape that is faceted and challenging to create. We had to have the stones specifically cut to exact measurements by our diamond cutter. When Eric presented the engagement ring to Tina, she was blown away! She and Eric worked together with Karen to create something unique for Eric’s wedding ring that borrowed from the design ideas of Tina’s ring. All of our custom designs are finished by hand, but these rings required even more engraving and tooling than normal. 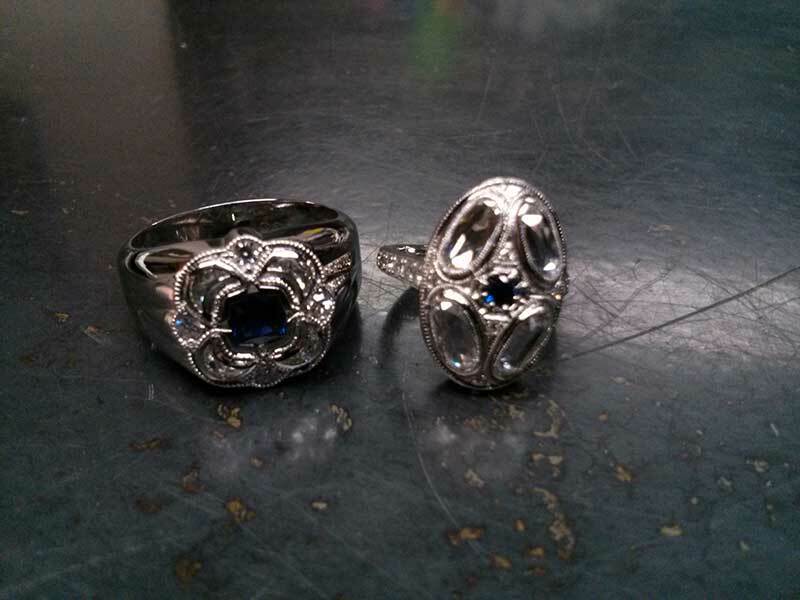 Corey, one of our in house jewelers, did an amazing job finishing them! This project included something that’s never been done before. 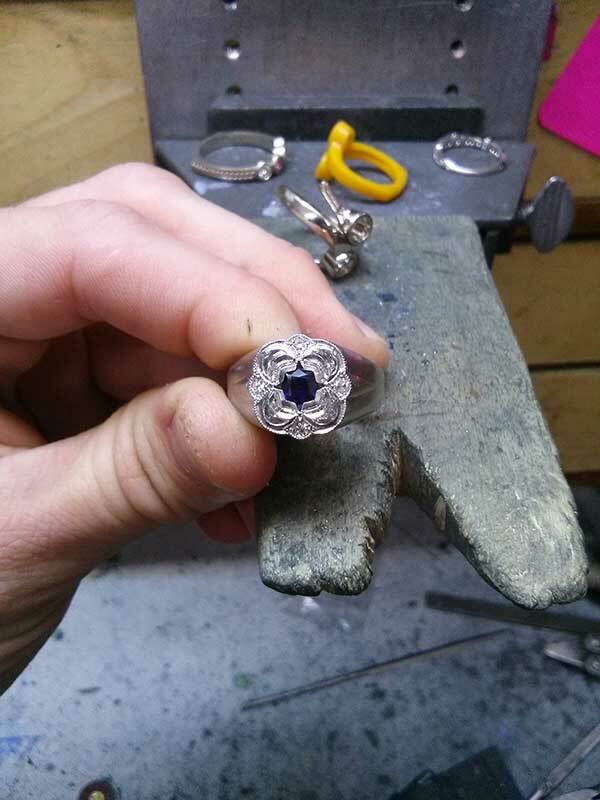 We’ve never seen a rose cut, crescent shape diamond in any jewelry item until this project. Congratulations to Eric and Tina on their recent marriage. Tina was able to wear her engagement ring for two years, and Eric was so excited to finally be able to wear his ring as well!